For generations landscape designers, architects, and authors urged home owners to add plants to their landscapes that gave them fall color. Their recommended lists would include plants such as liquidambars, maples, spirea, and wisteria. Notably missing from these lists were numerous edible plants with striking fall color. Here I’m going to feature a few of them, but I’m sure you can find many more as you explore edible plants in detail. Above: An Asian pear in it’s full glory. Above: The last of the pomegranate leaves still give a little spark to my back patio, and of course, at this time of year they also give up the last of their fruits as well. Notice the lemons in the basket; in milder parts of our country, most citrus also add color to the fall landscape. Above: One of the most spectacular trees in the fall landscape is the persimmon, this tomato-shaped Fuyu in particular. I enjoy it’s crunchy, very sweet fruits from early October through January. There are different types of persimmons; our native persimmon and numerous Japanese varieties. Hachiya, a popular acorn-shaped Japanese variety and the American persimmons must be ripened until the fruits are completely soft or they are VERY astringent and “puckery”. This type are best used in smoothies, cookies, and a traditional persimmon pudding similar to a plum pudding. In contrast, fruits such as the Fuyu are eaten when still crunchy, or allowed to ripen completely to the soft stage and used in the same manner as the Hachiya. I harvest my Fuyu persimmons as soon as most of the fruits have ripened to a rich orange color but are still hard. I then put them in the refrigerator were they stay firm through December. For nearly three months I enjoy them chopped up over non-fat, plain yogurt for breakfast, sprinkled over a lunchtime salad to give sweetness, crunch, and color, and during the holidays, when I cut them in eighths, wrap them with prosciutto and serve them as a light appetizer. Of course, most of us plant blueberries for their super delicious and nutritious berries in summer. However in most parts of the country blueberries give a dramatic bonus and turn a rich orange to red as the temperature dips in fall. When we think of strawberries we think of luscious, red fruits, not what the plant looks like. 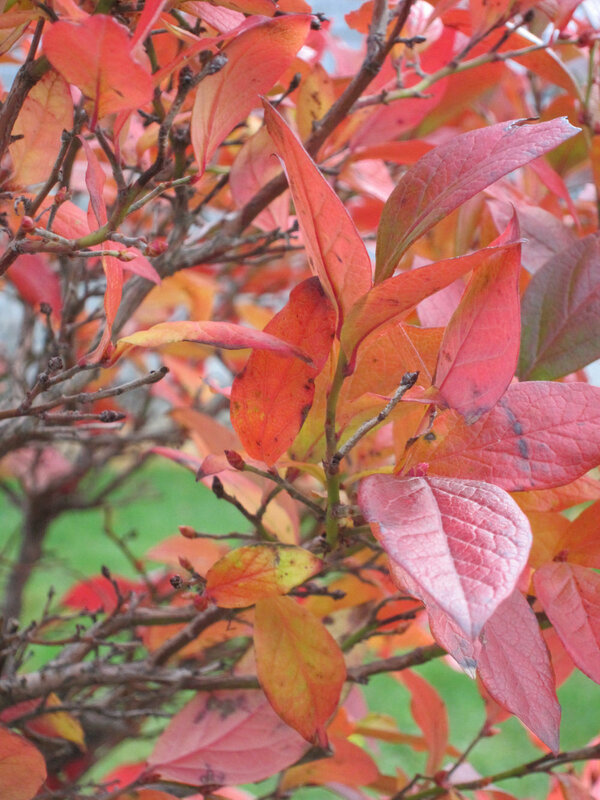 Who thinks of them as a colorful addition to a fall landscape? I do. In my experience, I’ve found that most varieties show some fall color; sometimes yellow, other times orange, and occasionally red like this day-neutral variety Tristar in a blue recycled wine barrel in my zone 9 garden.